Lethal Enforcers was created as an arcade shooting video game by Konami. The game was ported to the Super NES, Genesis and Sega CD in 1994. It uses a revolver-shaped light gun known as the Konami Justifier, which was included with the game. 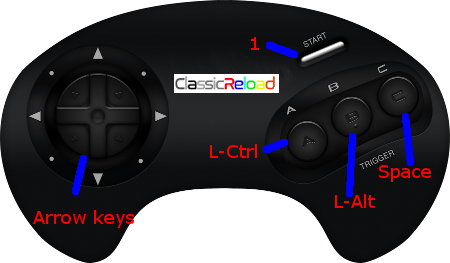 In the case of the console versions, a standard controller can be used too. The game puts the player into the boots of a police officer who has been assigned to the mission of stopping the increasing wave of crimes that put the city's security in jeopardy. It has five stages different assignments: The Bank Robbery, Chinatown Assault, The Hijackers, The Drug Dealers, and The Chemical Plant. During each stage the player must shoot the armed criminals without harming any innocent by-standers nor fellow officers. Most enemies are taken down in one shot. At the end of the stage, there is a boss that must be defeated in order to complete the assignment. The bosses usually shoot projectiles at you. The gun can carry up to 6 bullets. To reload, the player must aim it away from the screen and pull the trigger. In case of the console versions, if a controller is used, it is only needed to press an specific button. At the beginning of the game, three to five life units are available, which more can be purchased by depositing additional coins (only the arcade version). Life units are also awarded based on how many points you score during the gameplay. Every time the player is shot, one life unit will be lost, as well as whenever an innocent person or officer is shot. The game ends when all life units are gone, but continuous play is available. There are different ranks that you will attain, depending on how well you do. The ranks are Patrolman, Detective, Sergeant, Lieutenant, Captain and Commander. When the game begins, your rank is Detective and after each stage you will be promoted, but only if you do not kill any innocents. If you've killed innocents on any stage, you will either maintain your rank or you will be demoted. Additional weaponry can be found throughout the game that will give you better fire power: automatics, Magnum bullets, rifles, shotguns, grenade guns and machine guns. The grenade guns and machine guns can each be used only once, but the automatics, the Magnum bullets, the rifles and the shotguns can be reloaded the same way as your regular gun. If you get shot while you have one of those weapons, though, you will return to your regular gun. in the arcade version, a DIP switch allows you to set the game to "Arcade Mode" or "Street Mode". In Arcade Mode, one assignment follows directly after the other where, between each assignment, there is a target practice session where you try to shoot all the required targets to improve your accuracy. Street Mode gives you a choice of which stage you would like to go to, including a target practice stage.